Without proper pet vaccinations, your dog, puppy or cat is at risk of contracting one of several possibly fatal infectious diseases, most of which can be prevented with routine vaccinations. Vaccines are usually effective in more than 95% of pets vaccinated. Additionally, routinely vaccinating your dog or cat is often cheaper than paying for treating your sick pet later, and it reduces virus transmission in the pet population. What pet vaccines are commonly given and what diseases do they prevent? 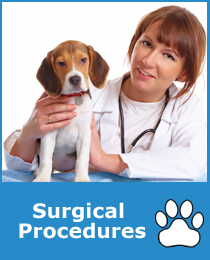 We customize each pet's vaccination protocol depending on their individual lifestyle and level of risk exposure to different diseases. We educate our clients about the various vaccinations available and the prevalence of each disease in the surrounding environment. 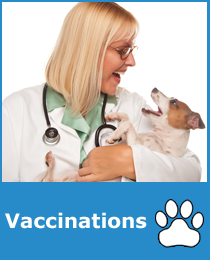 Please click on the animal you would like to learn more about vaccinating to learn more about pet vaccines. Rabies: Rabies is a fatal virus that affects the central nervous system of almost all mammals, including humans. The virus is most common in dogs, puppies, bats, cats, and raccoons. It is spread by contact with saliva on an open wound of the skin. The virus causes behavior changes, seizures, and death. Law requires rabies vaccination. Vaccinations should be given at 16 weeks of age and bolstered after 1 year for your puppy. After that the vaccine can be bolstered every 3 years. DA2PPV+CV: is given between 8-12 weeks for your puppy, and boostered between 12-16 weeks and again between 16-20 weeks. After that yearly boosters of DA2PPV (without CV) are required. As the dog ages, his immune system improves and is generally able to protect him from Corona virus. If an adult dog does catch this disease, it also tends to be much less severe than it would be for a puppies. Bordetella: Bordetella Bronchiseptica is a bacterial agent that causes the respiratory disease commonly known as kennel cough. 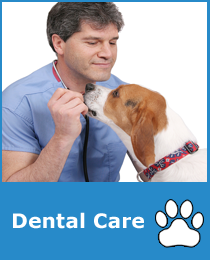 Kennel cough is characterized by a harsh, chronic cough, as well as possible nasal discharge and sneezing. It is usually considered to be a self-limiting disease, unless pnemonia develops from secondary bacterial complications. The dry, non-productive cough may last for weeks to months after the resolution of the clinical disease due to the damage done to the trachea. Most boarding facilities require this vaccine and dogs that live in shelters, pounds, or kennels should receive protection through the vaccination. The vaccine is given intranasal every 6 months for your dog or puppy. Lepto: Leptospirosis is an infectious bacterial disease transmitted by contact with the urine of an infected dog, rat, or other wildlife. Infection occurs through oral mucous membranes, the cornea of the eye, and the skin. The disease can produce very severe symptoms of high fever, depression, jaundice, internal bleeding, and eventual death. Recovered animals may suffer from chronic kidney disease. We recommend this vaccine for all dogs and puppies. 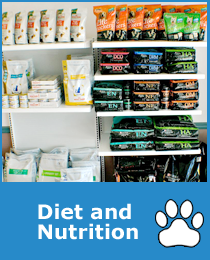 It is given between 8-12 weeks and bolstered between 12-16 weeks for you puppy. After that it is good for 1 year for most dogs. Rabies: Rabies is a fatal virus that affects the central nervous system of almost all mammals, including humans. The virus is most common in dogs, bats, cats, and raccoons. It is spread by contact with saliva on an open wound of the skin. The virus causes behavior changes, seizures, and death. Law requires rabies vaccination. Vaccinations should be given at 16 weeks of age and bolstered after 1 year. After that the vaccine can be bolstered every 3 years for your cat. FVRCP: This vaccine protects against Feline Viral Rhinotracheitis, Calicivirus, and Panleukopenia. Cat viral rhinotracheitis is a very contagious upper respiratory infection in cats. It is more common and more serious in kittens, but cats of any age can get it. It causes coughing, sneezing, eye and nasal discharge, and abortion in pregnant cats. Calicivirus is a respiratory virus which causes oral ulcers and blisters and leads to pnemonia and possibly death. Panleukopenia, or feline distemper, is a contagious viral disease that primarily affects young kittens, but any aged cat is susceptible. This virus is generally widespread, and natural exposure is common for cats. Despite early maternal protection, infection of newborn kittens is frequent. Clinical signs include: fever, loss of appetite, vomiting, depression, diarrhea, dehydration, and death in some cats. FeLV: This virus causes fatal infection in cats. There is no cure. It is similar to Leukemia in humans and can also cause cancer. Cats can be born with this virus or contract it from other cats. However, the virus can be prevented if the cat is not already infected. Therefore, we recommend vaccinating because there is no cure once a cat has it. We also recommend the FeLV test to all cat owners if their cat has never been tested. This test is a snap test that takes just a few minutes to complete. A small sample of your cat's blood is taken and placed on the snap test along with a special solution. The mixture is allowed to sit for 10 minutes and then is read.